Colleagues of a policeman fatally wounded in a triple stabbing have paid tribute to him. Pc Jon Henry was responding to reports of an assault on a window cleaner in Luton when he was attacked on Monday. Two other men were also stabbed, with one of the victims said to be in a serious but stable condition. A man has been arrested on suspicion of murder. 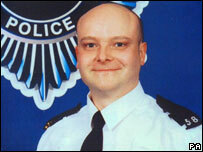 Chief Constable Gillian Parker said of 36-year-old Pc Henry: "His dedication to his duty cost him his life." She said: "Jon was one of a large family, a very close family. Jon was a much loved son, brother and husband." He leaves a wife Mary and a baby Maggie, who is weeks away from her first birthday. Nicky Dahl, divisional commander for Luton, said Pc Henry had been in good spirits just minutes before he was sent out on Monday morning. He said: "Jon had been in the police service for three years, and was described by his colleagues as a great guy, always cracking jokes. "At the briefing this morning, he was doing the same. They always laughed, because the jokes were so bad. "His family described him as someone who was just doing the job he loved, and as someone who loved life." Pc Henry died at Luton and Dunstable Hospital where the two injured men are being treated. One of them, a 55-year-old from Luton, was stabbed in the back. Police have not given details of the second man. Pc Henry was attending 999 calls from two members of the public after a man, said by witnesses to be a window cleaner, was attacked with a knife in Luton town centre. The constable attended in a marked police car and was with a number of other officers when he was wounded. Police used a baton round and Taser electric stun gun to restrain the knifeman. On Monday Det Supt Keith Garwood, who is heading the murder inquiry, said: "The family are very traumatised by this and are understandably upset and angry. "This man came to work and they were expecting him home this afternoon and he is not going to be there."